Mana Vooru Mana Badi 2018 Revised June 4th-11th June. Rc. No. 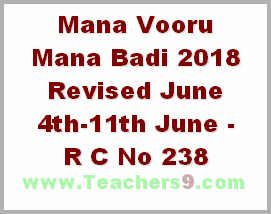 238/A& I/2018 Dated: 13/04/2018 Sub:- School Education – MANA VOORU – MANA BADI Campaign - Completing the School Admissions for the academic year 2018 – 19- Instructions issued – Reg. It is proposed to take up a special campaign "Mana Vooru - Mana Badi" to complete the Admissions for academic year 2018-19 in all Government/Mandal Parishad /Zilla Parishad Schools from 4th June to 11th June.